Chinatown is under threat from yet another tower. This time it is in the heart of the neighbourhood. 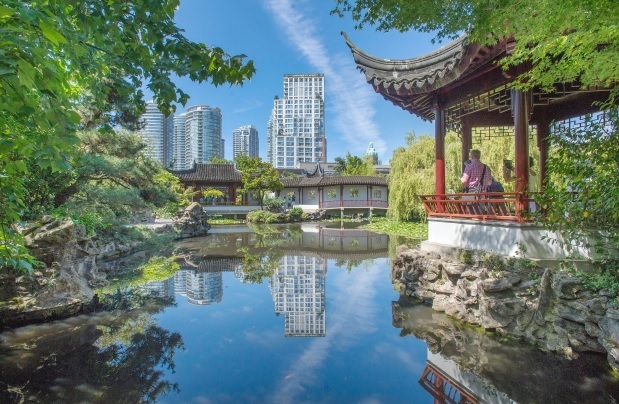 The site is on Keefer Street across from the Chinese Cultural Centre and the Dr. Sun Yat-sen Classical Chinese Garden and Park, and adjacent to the new Chinatown Memorial Square. Opposition to the recent design comes from many fronts. The proposal by Beedie Living and consultants Merrick Architecture is to develop a new 13-storey mixed-use building with 127 residential units, 25 senior social housing units, and commercial use on the first two floors. • the proposal did not fully recognize the sensitivity of the site in relation to the Heritage Area, Memorial Square, Dr. Sun Yat-sen Garden, and the nearby museum. The city’s Urban Design Panel also voted last month not to support the proposal. News 1130 reports that former premier Mike Harcourt says Vancouver’s historic Chinatown is “teetering on the brink” and this one huge bulky building is causing particular alarm since the high-end condominium proposal would tower over the area, including the Dr. Sun Yat-sen Garden and the Chinese Cultural Centre. “Development should re-energize and revitalize Chinatown, but not overwhelm it. This building dwarfs all of the heritage buildings of the Chinese community along Pender Street and it’s just too much,” Harcourt said. Harcourt serves as chair for the Building Community Society, which has written a letter asking Vancouver’s mayor and city councillors to vote against the current proposal. The Sing Tao newspaper reports that the chairman of the Chinese Benevolent Association, James Chu, says we should not only look at the money involved. “It doesn’t matter the amount. It is still a kind of betrayal to Chinatown,” he said. The Dr. Sun Yat-sen Garden is indeed a cultural gem worth protecting. The Vancouver Sun reported in 2011 that the attraction was named No. 1 on a list of city gardens around the world in a new book by National Geographic. It is rated ahead of the Rodin Sculpture Garden in Paris and was one of just three North American gardens cited, along with the Foster Botanical Garden in Hawaii and the Conservatory Garden in New York’s Central Park. Further, in 2012, the garden was given the title of “Canadian Garden Tourism Garden of the Year”, awarded by Canadian Garden Tourism Council in consultation with a Canadian and international jury. Chinatown was given a National Historic Site of Canada designation in 2011. It is the largest historic Chinatown in Canada and one of the largest in North America. Despite this significance, there have been a number of city planning initiatives from EcoDensity in 2007, the Heritage Area Height Review in 2008-9, the Downtown Eastside Local Area Plan of 2011-2014, and changes to the transfer of density policy that now allows bonus density to be landed in Chinatown. These plans undermine Chinatown’s heritage character and effectively limit heritage protection only to the properties on Pender Street. 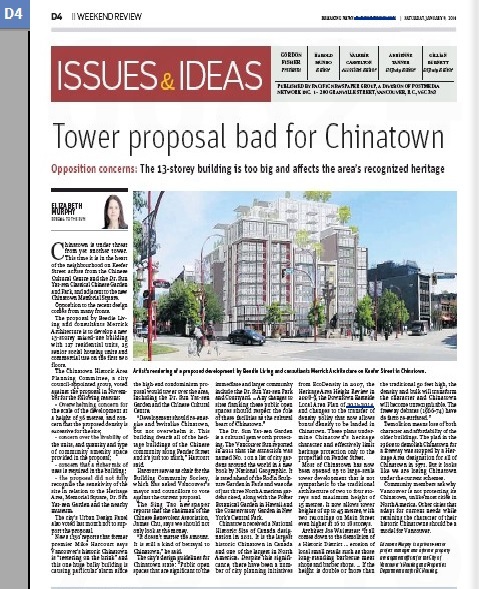 Most of Chinatown has now been opened up to large-scale tower development that is not sympathetic to the traditional architecture of two to four storeys and maximum height of 50 feet. It now allows tower heights of up to 150 feet, with two recent rezonings on Main Street even higher at 16 to 18 storeys. Demolition means loss of both character and affordability of the older buildings. The plan in the 1960s to demolish Chinatown for a freeway was stopped by a Heritage Area designation for all of Chinatown in 1971. But it looks like we are losing Chinatown under the current schemes, even without the freeway, so this situation is reigniting opposition. Community members ask why Vancouver is not protecting its historic Chinatown, unlike most cities throughout North America. In San Francisco’s Chinatown, the architecture is protected and anything new reflects that character. “As it is now clear that we don’t want what is being built, the 105 Keefer Street rezoning becomes the ‘line in the sand’ if we, Vancouver (not just little Chinatown), would like some form of character as a city, besides the God-given mountains and inlets,” said Wai. Other cities that adapt for current needs while retaining heritage character of their historic Chinatowns should be a model for Vancouver.